Prior to WWII, the Luftwaffe had a group of general officers that realized that the nation needed a strategic bomber. As is often the case in things like this, there is one person who truly is a believer and helps to not only win over the rest of the hierarchy, but is a driving force to get things done. Those who are knowledgeable about the pre-war Luftwaffe know of whom I speak. Those who don't can look it up and make this a learning experience. The result of his efforts were the Do-19 and Ju-89 four engine bombers. Neither of these really met the requirements, but then again, neither did the prototype B-17. Unfortunately, this man died in a plane crash and the movement towards a real strategic bomber force died with him. Still, a strategic bomber was needed and so Heinkel, who was considered the 'bomber' man was tasked to providing a heavy bomber. Unfortunately, the amount of meddling in the design doomed the aircraft to failure. First was the requirement to use paired engines to give the power needed. Secondly was the requirement to make it into a dive bomber, something this sort of airframe would never be successful in doing. The result was a plane that really wasn't good for any of the tasks it was given. 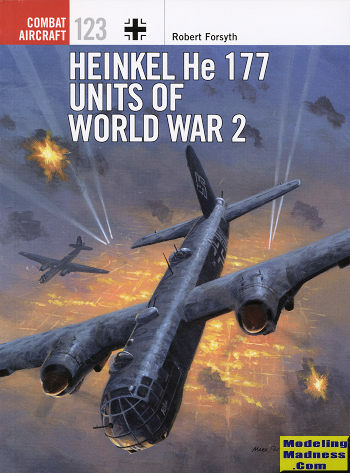 Had Heinkel been given the opportunity to use four engines and not have the plane built as what it would have been originally designed for, not only would it have not been the trouble-plagued airframe that it turned into, it would have been in service years before it actually was. This book covers the design and political meddling in that design very well. Its troubled and lengthy development are fully detailed and that alone is a fascinating part of the story. We also get the operational history of the type as it is used for maritime operations, as a standard bomber in the 'baby blitz', and the one place it was actually fairly successful (at least for a short time), doing actual strategic bombing in the Eastern Front. Unfortunately, that was cut short as it was demanded that they be used tactically as ground attack aircraft and the result was heavy losses. In addition to a very readable story, the book follows the mold of the series with superb period photos and an excellent selection of full color profiles. It is very easy to recommend this one to you, especially if you want to know more about this plane and its operational history.